Optimized for a 1024 pixel width screen. Other screen widths may cause text and graphics to overlap. I also saw the assembly of the 3/4 plate. The process is a simple one (at least it looks simple…and not like the nightmarish teethering sunflowers in Walt Odet’s musings on the Saxonia)…begining with the base plate, the watchmaker put the lower pivots of the wheels on the base rubies…the wheels could stand, upright in their ruby wells. When she has completed putting in all the pivots of the wheels, a process which strikes me more like inserting the wheel pivots, she takes the 3/4 plate, and just eases it over the guide pins…and the upper pivots of the entire wheel train, almost automatically…magically slots itself into the rubies in the 3/4 plate. A small amount of jiggle with the tweezers was all it took. Amazing! Later, Richard Habring told me that it was so easy to put on the 3/4 plate because of the extremely high precision in which all the components are made. Parts are made in the factory premises using spark erosion technology (as shall be seen in Part 3 of this report) is extremely accurate, and can make extremely fine details, but is also exceedingly slow. As discussed in Part 1, between the two assemblies each Lange watch undergoes, the parts are sent to the finishing department for the fine hand finishing work…after the first assembly, all parts belonging to each watch is kept together…like a family. The finishing department visit began with at the station which does the beautiful faus cotes…known in Germany as Glashutte Stripes, and in Geneve as Geneva Stripes…a mark of craftsmanship. These are applied by a spining disk of paper (!) onto the plate, which is temporarily bound to a computer controlled platform…the platform moves the plate which engages with the disk to create the stripes. Each contact with the spining disk, rubs (cuts?) off a little of the material, at the same time, giving the surface a shimmery polish characteristic of this finishing. Each stripe you see on the final watch, represents 3 application of this disk. I was told that most other manufacturers use a completely automated process, and because of the relative hardness of traditional rhodium plated bridges, pith wood is used in the spining disk, instead of paper. Each piece is then carefully visually inspected by the operator, before it is passed in a plastic tray over to the next station. The next station is the one which applies perlage. In many completely automated factories, which make hundreds of thousands of ebauches per annum, this is done by a computer controlled machine, which feeds on unpolished plates, and spits out…so to speak, perlaged ones. Here in Glashutte, Lange still honours the time tested tradition of hand polishing for perlage. As can be seen in the picture right, each little swirl is hand made by this lady, who applies a spinning disk by lowering the lever (fans of the La Pavoni espresso machines would love this machine! ), much like that used for the stripes to the plate. She then repositions the plate, by hand and coordinated by eye, and makes another swirl…so she toils till the entire surface is completely covered in the much revered perlage. Anglage is done in a similar method. Except that the part to be anglage is held by a special tool, and the anglage is done by a small hand drill-like tool, with a spining cylinder. By applying the spining cylinder to the edge of the part, anglage is made. This is, again a painstaking and manual process…a mistake would mean ruin to the part. Of course, all this takes place under loupe, and the end result is very satisfying to the eyes. Again, in contrast, anglage is a chamfering process made by computer controlled equipment in the large ebauche manufacturers. The resulting anglage is even in thicknes throughout the edge, and is itself polished. In the larger parts, like the edge of the 3/4 plate, the anglaged egde too is anglaged…giving the plate’s edge 3 anglages (one at 45deg, and two more lighter ones at 30deg and 60deg to the edge). Next up, the insertion of rubies into the chatons and the anchor. I was able to witness the insertion of the two pallets to the anchor. This is done by friction fitting the rubies to the polished lever anchor, a process accomplished by this lady seen on the left. Also visible in the picture is the plastic (so as not to scratch the delicate parts) which is passed from station to station, carrying the parts of the watch. After she has completed the insertion, she examines her work, under a 100X microscope, where the lever she has just completed is projected against an exact template, showing the position of the jewels in the two critical lock and unlock positions of the pallets. When she is satisfied that the pallets are in proper positions, she then applies a kind of glue, and seals the relationship between the pallet jewels and their soul mate…the anchor. Steel parts were also given their mirror finishing at the finishing department. The process is primitive, but effective. Take for example, the small steel plate which holds the jewel of the fifth wheel (also known as the escape wheel). This tiny steel plate, no more than about 5 square milimeters, is put onto a cork pad (kind of like a mouse pad), and the goldsmith takes a piece of polishing paper (diamond polish embedded), and manually rubs the plate…and she continues for about 15 minutes to half an hour on that single plate, in the process creating the black polish, which gives that small plate the characteristic high gloss sheen. After parts finishing, the parts are sent back to the base train assembly team, for reassembly. On completion of reassembly, the watch, in its case is sent to the Timers…the name given to the small of group of watchmakers, whose task is to make the watch tick with accuracy. The watches are regulated to 5 positions. And as a mark of respect of workmanship, the lever of the whiplash regulator is required to be always pointing in a position that it is exactly in between the two ends of the swan neck. 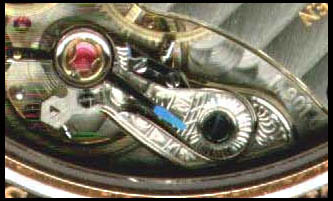 If regulation work is required so that the pointer is set to one side, the entire balance is taken out, rebalanced using tiny…almost microscopic washers attached in pairs to the screws on the balance wheel, and the entire balance re-regulated so that the lever points central, as can be seen in below…I have witnessed Willie Quek, Master Watchmaker in Singapore, perform this delicate task on my own watch. Proceed to Part 3, see the CNC machines, the Spark Erosion machines, the Repair Department, the Restoration Department, and the Watchmaker School. Legal Disclaimer All the information and contents posted on this page are the property of Peter Chong, and are protected by U.S., U.K. and other foreign copyright and trademark laws. By accessing this page, you agree to the following terms and conditions. If you do not agree, you have no right to use this page. 1.This page and its contents may not be copied or distributed in any manner (electronic, web or printed) without the prior written consent of Peter Chong. With the following exception: You may copy up to 10 words or paraphrase an article provided that you attribute the material to Peter Chong. 2.Peter Chong MAKES NO REPRESENTATIONS OR WARRANTIES WITH RESPECT TO THIS PAGES, ITS CONTENTS OR THE MANUSCRIPT, WHICH ARE PROVIDED FOR USE “AS IS” AND IS WITHOUT WARRANTY OF ANY KIND.